Last week I had the pleasure of facilitating the Open Knowledge Foundation‘s Staff Retreat. Marieke Guy has blogged about the retreat here. I was extremely impressed with the number of passionate, committed and talented people working for this organisation. During the retreat, it emerged that many of the staff feel over-committed and were expressing a desire for a framework on how to say ‘no’ to all the opportunities that came to them. It got me thinking about how this is a larger epidemic within our sector. Image copyright seanwes. Used with permission. First, ask ‘is this mission critical?’ Does this help your organisation on its road to reaching its strategic goals? This might be the hardest thing to consider. Hang your mission statement above your desk, make sure any short pithy statement that encapsulates the goals of the organisation is insight. 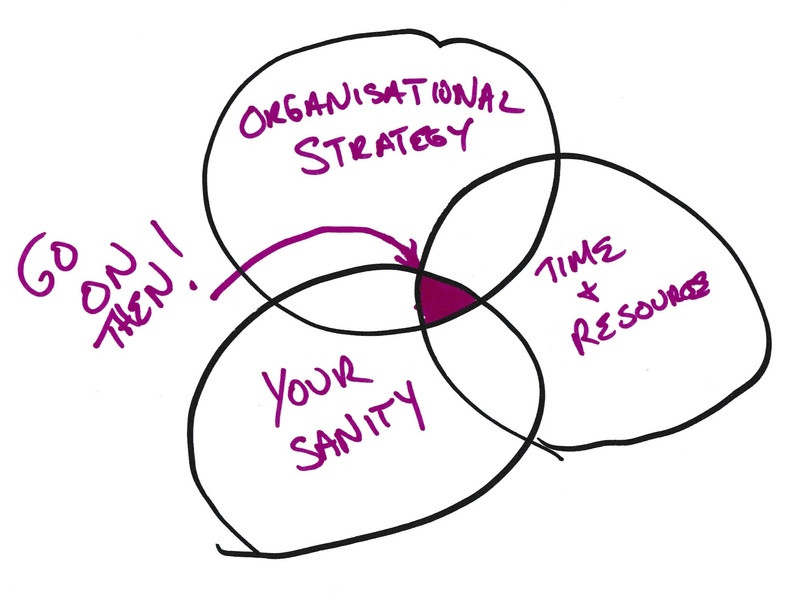 Hopefully, your organisation has a vision of success or an organisational strategy you can use as a guide for what makes sense. How will the time and resources it takes to do this be paid for? If you’re organisational time is being paid by grants, you need to honour those commitments first. Also consider, if the effort is going to an event and will involve travel, who is going to pay for the time for you to attend the event? And who will pay for the travel? If you’re organisation has some core funding or money for staff development, then it may be covered internally. But never, ever make assumptions about this. Are you already over-capacity? Are you missing deadlines already? If your current task list is unmanageable and you aren’t getting enough sleep at night because you’re a stress puppy, it’s not going to be worth you taking this on as well. And if you don’t say ’no’ to something you can’t deliver on, it’s not helping, it’s hurting. Always, always consult your to-do list. Of course there are other things you could consider. Will this be a good learning experience or will this get you to spend some time with people you admire and enjoy being with? But these considerations should come in well after you’ve considered the three things above. For more on saying ‘no,’ see this post on keeping a ‘no thanks’ journal from my buddy, Beth Kanter.